HomeforumsAccidents, Injuries and Malformed L…Bringing a tripawd into our home? Bringing a tripawd into our home? Hello tripawd community! I am coming here for some advice. We have been looking at rescue websites and found a tripawd friend that had his leg broken and never healed so he was rescued and had it removed. He is 6 months old. We currently have a dog in our house who is 2 years old and has a moderate energy level. He does like to rough around a bit with dogs, but the puppy is very active and is also a shepherd mix just like him (same sizes, but the puppy was also malnourished) we already dealt with malnutrition and neglect with our first pup, so the only thing I am concerned with is the three legs and having him in the house with my other dog. I am a dog trainer, so I know how to introduce them properly etc. I just don’t want him to be overwhelmed. He is in a home with 5 other foster dogs at the moment, I’m just unsure it’s a good idea. Hi and welcome! We’re so glad you came here to ask these great questions. Your future posts won’t need approval so post away. My guess is that if he were to come to your home for good, it would be like a vacation for him! After being in a house with five dogs, he’s probably exhausted and in need of some good down time. If his surgery was fairly recent, he may not have had the chance to rest properly. Our own Wyatt Ray came to us from this exact scenario and although we don’t have other dogs, we could tell that he needed a rest by the time we got him. What I would be concerned about is how you will manage exercising him and your other dog at the same time. Both are pretty young and need activity and fitness, but they have two different types of requirements. For example, a Tripawd should have shorter walks of 10-20 minutes tops, 2 or 3 throughout the day. If you’re used to going on long walks with the 2 year old, this may be a problem. Others with multiple dogs have invested in a dog stroller and found it works great for getting the whole pack outside. 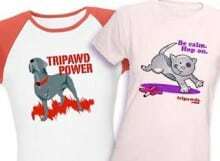 If you choose to adopt him we have lots of fitness tips in the Tripawds e-books library and our Tripawds Gear, Tripawds Downloads and Tripawds Amazon blogs. Also, The Tripawds Foundation will pay up to $100 toward his adoption fee! Let us know if you decide to go for it. You sound like a perfect pet parent for him! Add Reply: Bringing a tripawd into our home?